Hygiene care potentially produces a great deal of static load on a caregivers body  when they are  showering or washing  a resident  as they are often leaning in over the  resident for a longer period of time, without being able to support their own weight, as both hands are needed to carry out the hygiene procedure. Using ergonomically supportive hygiene equipment, such as high-low showering chairs or trolleys, has been proven to help reduce static load on the caregiver.4  The correct equipment enables the caregiver to come close to the resident and also adjust the height to fit their needs and the specific task they are carrying out. 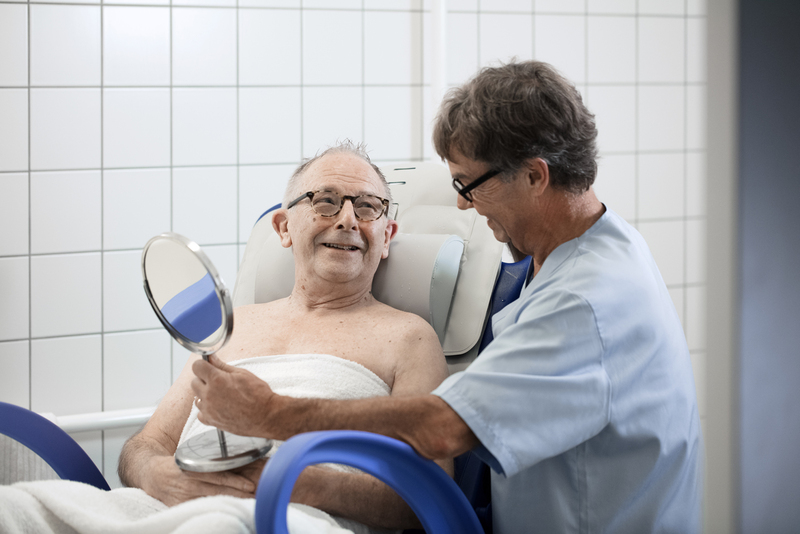 It has also been shown that using adequate equipment can stimulate mobility in residents without taking more time.4 This means nursing procedures can be improved at the same time as improving the health and quality of life for the resident, all with the introduction of the correct showering chair or trolley. For more information, download a study summary on prevention programs for Hygiene Care which elaborates on different washing techniques and equipment to help minimise static load.